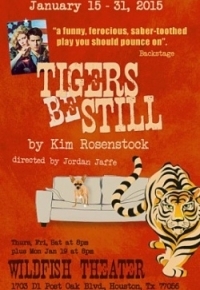 Black Lab Theatre presents Tigers Be Still - Printer Friendly Page - On the Run - Theatre Port Houston - Theatre Auditions News and more! A tiger has broken loose from the local zoo, but Sherry has bigger problems. She's a recent college graduate with a master's degree in art therapy, and like so many 20-somethings she finds herself back home, unemployed, and overwhelmed by her "quirky" family. Happily, things begin to brighten up when she gets hired as a high school art teacher. Now if only the principal would leave his rifle at home, her sister would get off the couch, her mother would come downstairs, her first patient would just do one of his art therapy assignments, and someone would catch the damn tiger, everything would be perfect. Thursdays, Fridays, and Saturdays and Monday January 19 at 8pm.